can be addressed without talking of God. And yet they reveal something about what it is to be human. The fact that I didn’t expect this is telling in itself: this is, obviously, one of, if not the key question in most religious traditions. But I just don’t think about it very often. Still, I’ll take a crack at it. To answer the first question: I don’t think anything happens when I die. My best guess is that my consciousness/ego/soul simply ceases to exist. And how do I feel about this? Well, obviously in some sense I fear death. We all do. I’d have a pretty strong reaction if my doctor told me I had a month to live. But aside from that purely primal response, does it bother me that my consciousness will eventually cease to exist forever? Not really. I understand that this is a pretty unsatisfying answer. But it’s not glib. It’s just a plain description of what my interior life is like. I don’t go through life like Woody Allen, thinking that human existence is an implacable existential horror. But neither does it bother me that my own existence won’t last forever. It never has, not in childhood and not now. And I’m not sure why. It just doesn’t. For what it’s worth, my instinct tells me that this is primarily an aspect of temperament you’re born with. Either you have a strong emotional reaction to the idea of eventual nonexistence or you don’t. If you do, religion is the most common way of dealing with it. The particular religion you choose is obviously mostly cultural, passed down from your parents and peers the same way you learn a particular language as a child, but the motivating fear itself probably isn’t. But either way, does this really reveal something essential about what it means to be human? In one sense, yes: a knowledge that someday we’ll die is unique to humans (though fear of death plainly isn’t), and our response to that knowledge has been a defining feature of human cultures for millennia. Still, there are hundreds of other things that are unique to humans too, and I don’t think there’s any special reason to give this one pride of place. And one final footnote. 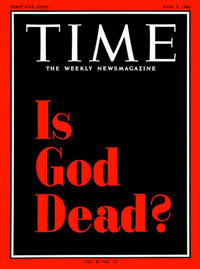 Since Nietzsche keeps coming up in these discussions, keep this in mind: he may have had a healthy trepidation about what the world might be like if, indeed, God were truly dead, but a lot of time has passed since then and we pretty much know the answer now. In the land of Nietzsche’s birth, less than half the population believes in God and less than a quarter can be called Christian in any but the most anthropological sense. Over the past half century Europe has become essentially a secular society, and it seems to be working out fine. I suppose you might argue that this is a fool’s paradise, that they’re subsisting off the dwindling religious capital of the past two thousand years, but that case gets harder and harder to make with every passing year. They’ve basically given up religion and nothing has happened. They still produce plenty of art and science, they live happy lives, their moral sense is intact, they haven’t become nihilists, and they appear to love and cherish their families and friends just as much as they ever have. If Nietzsche were alive today, he’d probably consider the tradition of tragic atheism that he himself created to be rather quaint. Perhaps we should too.